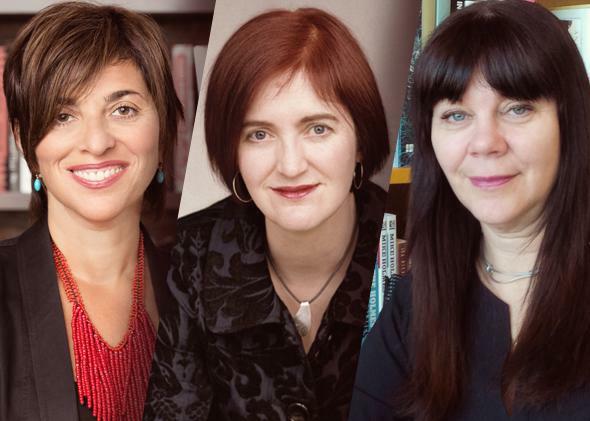 Interview between Emma Donoghue and her editors in America and Canada. The Slate Book Review author-editor-editor conversation with Emma Donoghue. As is the case with many novelists with an international profile, Emma Donoghue has more than one editor. Her newest novel, Frog Music—her first since the best-selling Room—was edited by both Judy Clain, editor in chief of Little, Brown in the U.S., and Iris Tupholme, editor in chief of HarperCollins Canada. The Canadian novelist and her two editors talk about sharing responsibilities, resolving disputes, and the long list of ideas Donoghue has waiting for the novels to express them. Judy Clain: Emma, what is it like working with two editors on your books? When I came aboard for Room, I was the new girl stepping into an old relationship. So I was very conscious of the fact that the two of you might have had systems and ways of working together in place. Emma Donoghue: Well, I think Iris and I had worked together on only one book ahead of you, so it’s not as if she had been my editor for 20 years and you were intruding or anything. I suppose it was less scary for me because I knew one of my editors (Iris) already. But Room felt like a new experience anyway—there was so much excitement about its publication worldwide from the start. So I had no sense that you were the new girl, Judy. Clain: Well, that’s good. What helped for me, just in terms of process, was that you, Emma, were very clear from the start that you wanted to hear from both of us separately. And I think with some authors where there are two editors working on a book, they get together behind the scenes and communicate about the edits and combine them into one editorial letter. And you wanted to hear from me, what I thought, and from Iris, what she thought. And I suppose we’re lucky, or maybe it’s not luck that neither of us said anything that completely contradicted the other! Donoghue: It’s very interesting that you say that some authors ask for a single editorial letter. I much prefer to get everyone’s opinions separately, because if I got a single editorial letter, it would be like getting a note from God! Clain: I know. Well, I think it’s an unusual situation. But I think that with many authors, especially younger authors, they might get confused by hearing two different voices. And so for them having one set of notes that suggests to them what to do is perhaps easier, whereas I think you would sort it out if one editor said one thing and the other said something totally different. Donoghue: Yeah, I’m not looking for a homogenous, blended editorial view. I love the specificity of one of you being confused by Page 10 and one of you being irritated by Page 20. Also, I often have three editors (including the U.K.), and I find that if two editors agree on something, I pretty much give in and say fine. But if only one editor out of the three makes a point, I might think, “Oh, that’s just a minority view!” I didn’t specifically ask all three of you when you guessed who the murderer was in Frog Music, but I know that Iris figured it out early, and so I remember thinking, “One in three of my readers, that’s too many! I’m going to have to fix that and remove some of the hints there.” It’s useful for me to have the entirely individual feedback you each give me. Iris Tupholme: Frog Music was a more thorough edit than Room, because it’s more complicated in its setting and main characters. With an historical novel, so much more needs to be on the page in terms of detail so that the reader can locate the character in the setting. Everything from the way the city streets of San Francisco’s Chinatown looked in 1876 to Blanche’s clothing when she dances “The Flea” and to the particulars of a Baby Farm. Each detail has to be perfectly placed to create the backdrop and yet not get in the way of the story. Clain: What is it like when you first give your work to us? Are you nervous? I never think of you as being nervous! Donoghue: When I hand it on to you editors, I’m extremely nervous that you won’t like it. With the first book bought by any one editor, there’s no prior relationship there, so in a way I don’t take the judgments personally. But as soon as I’m onto a second or third book, I really want the relationship to continue, and I hate to disappoint. I feel like a child handing in my essay to a trusted and beloved teacher. So of course I’m afraid you won’t like it. But I would say that once you’ve bought the book, I then relax, and I feel OK that I may get 30 pages of editorial notes from you, but that’s fine, because we’re all working toward the same goal here. Clain: Iris, I’m curious just because obviously we’ve had such a great working relationship, the three of us. You don’t have to name names, but have you ever gotten into a situation with another author being published somewhere else where you’ve completely disagreed about something fundamental in the edit? Tupholme: No, not yet. I’m looking forward to that! When I read the other editor’s editorial notes or have a conversation with the author who has already then received the other notes, sometimes I’m surprised by the emphasis that the other editor puts on something that I might not have thought was crucial or interesting or relevant, but the other editor feels strongly about that point. And then, in the end, if the author calls, we do quite often have long conversations about the other editor’s notes and talk them through to see if they make sense within the author’s vision of the book. Donoghue: You know, me neither. I’ve always found my editors’ suggestions to be compatible. They make different points but almost never directly clashing points. And of course I do feel it’s my call in the end, so I’ve had times where I reject certain views of one of my three editors, but it’s never caused a big fight. It’s never been something really substantive like, “I think you should cut the second half of the book,” or something like that. Because I’ve had some encounters with the world of film, I often tell friends how different film is than the publishing world, because in film, these people have to invest so much money in every scene that it gives them the right to boss the writer around. In the publishing world, it seems as if what you want is my best book, and you want to have me get there, but you’re not going to tell me what to do. So I’ve never felt bullied within the editorial relationship. Tupholme: How about you, Judy? Have you ever had another working relationship with an editor where your idea about how the novel should be developed is radically opposed? Clain: No, not in terms of how the novel should be developed, but I did have one situation where there was a political issue. There was a scene in the book about the burning of the Quran, which this particular editor felt would be hugely inflammatory in their territory. And the author felt very strongly about keeping it in, and so there was a lot of back and forth almost to the point of things coming to blows. It was really complicated for the editor. She had very strong feelings about the scene, but at the end of the day, as you say, it was the author’s choice. It actually all worked out fine in the end. But it was an intense conversation, and pretty unique! Tupholme: What was the inspiration for Frog Music? Donoghue: It all began with the murder: I came across it in somebody else’s book. There’s a wonderful historical survey of Victorian women called Wild Women by Autumn Stephens. She lives in the Bay Area, and literally one little paragraph of hers was on Jenny Bonnet, and it mentioned the circumstances of this murder. And I thought Jenny Bonnet was a perfect murder victim in that she was such a maverick figure, a joker, a rebel, and so she seemed the right kind of person to get shot dead at 27. Her character and plot fit together in the way they do in the best works of literature, whereas in real life it’s pretty random who gets killed. What surprised me in the writing process was that the survivor of the crime, Blanche, turned out to be the single point-of-view character. I tried it a few ways, and I tried it in a different order, and I tried it with Jenny telling half of the story, but it turned out to be very much Blanche’s angle on the whole thing. It’s always fun when a project, even the one that you’ve been planning for 15 years, then surprises you in how it works out. Clain: While you’re writing Frog Music, are you thinking about the next book? Do you always have your next project in mind even when you’re working on the one you’re absorbed in? Clain: Well, that’s good for us, right, Iris? That means we’ll still be in business if Emma’s got four more ideas. Frog Music by Emma Donoghue. Little, Brown.